I'm Not Eavesdropping; I'm plotting! My teenage daughter was less than thrilled when I told her that I was thinking about chaperoning an overnight school trip so I could listen to the kids talk. It would help with the y/a novel I'm writing, I explained. I would never get their inside jokes she countered (and what fun is it to have your mom come along anyway?) When I thought about it, I realized the inside jokes didn't matter. Well, it didn't matter if I got them or not. What mattered is that they have them, just like my friends and I did when we were teenagers. The heart of a story comes, for me, from my own childhood and adolescence. The rest is window-dressing. When I visit schools, kid ask where I got the idea for my "Winky Blue" books published by Mondo (grades 2-4). The truth is, I always wanted a baby brother or sister. In my mind, a baby would add a cozy link to what in my mind was our less-than-ideal family. When no baby came, I decided a pet was the next best thing. My first real-life adventure with Winky was to teach him talk. The instructions that came with my “Teach Your Parakeet to Talk” record said all you had to do was put on the recording and leave your parakeet alone for a while, and presto! He’d be talking like a pro. I couldn’t wait to get started. On Saturday morning, I set up the record player next to Winky’s cage and carefully put on the record. “Cheep. Goofunkle!” chattered Winky, hopping back and forth on his perch. “Teaching your parakeet to talk will take a little time,” continued the voice, more serious now. I hope it doesn’t take too long, I thought. I want to start having exciting adventures with Winky right away. “Hello, how are you?” the man said slowly. I tiptoed out of my room, carefully closing the door behind me, while the recording droned on and Winky chattered away in parakeet language. I decided to give him a full hour to let the lesson really sink in. I opened the door later in high hopes. I just knew Winky Blue would be a quick learner. “Hello, how are you?” a voice greeted me. It was the man on the record. My face fell. Winky hadn’t learn a single word! 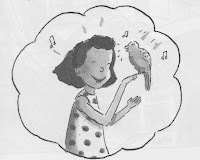 At the time I was terribly disappointed, but looking back I saw something funny in the high expectations of a little girl for her very ordinary parakeet, and for the possibility of drama (like me, Rosie is not a patient person) when illusion collided full-speed into reality. 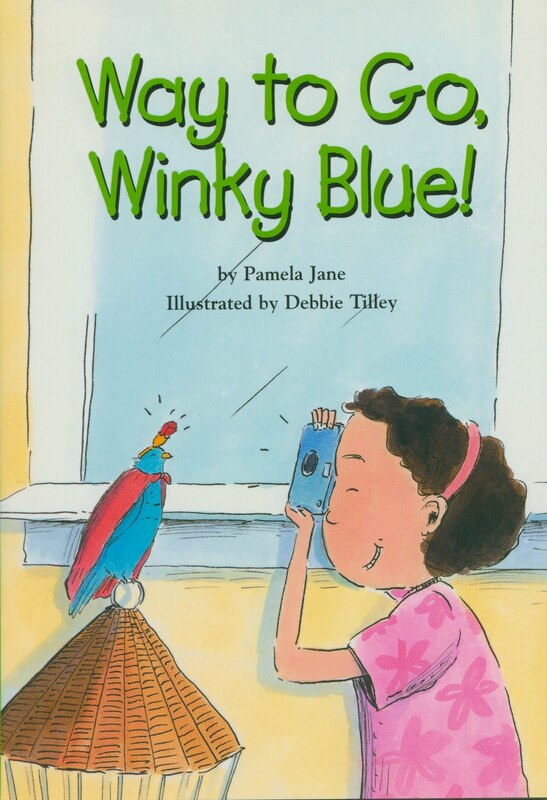 When I wrote the first Winky book, No Way, Winky Blue! I dropped the talking episode into it, just the way it happened. The hopes, fears and dreams we have as children don't change much with each new generation. It's just the outer details that change, the window dressing. But anyway, I decided not to go along on my daughter's field trip, a decision I'll probably regret when she's in college and I'm struggling to finish my y/a.